IN THE HEART OF THE DOOR PENINSULA! Whether you have a 45' motorhome, a tent, or something in between, you will feel right at home in our peaceful park-like setting. We have many large, level, pull through sites. Located just outside of Baileys Harbor. We stayed there 6 weeks and could have stayed longer. Great family owned and operated. Hosts were very accommodating and friendly, great location, and they ran a great campground. We have stayed the last 9 years, and have reservations for next year. The owners are friendly and welcoming with good suggestions for restaurants, shopping etc. Their campground is very clean with spotless restrooms and showers. We love Door County and this is a great place to camp, on the "Quiet side" of the peninsula. Stayed 9 nights. Had a great visit to Door County area. This facility lacks amenities and needs improvement. No cable or satellite reception. WIFI only works at times and slow. Gravel roads with holes. Site are a little close together. Sites are as level as possible when you consider the little amount of gravel on only a few. Little consistency from site to site. Rain makes a lot of mud and messy RV on the inside. They don't allow outdoor rugs. So with little gravel or grass at each site it could get dirty. Looked at several other campgrounds in the area found better in the same price range. Would not return or recommend this facility to fellow campers. We camp here about once a year. There have been no road inmprovements in the past 3 years. There are potholes and very little gravel left. When it rains, it turns to mud. Some of the sites are unlevel and muddy when it rains. They need to add some gravel to the roads and level and add gravel to the sites. I'm not sure we will be back. WiFi is really slow. No cable or satellite. The only stations you get with an antenna are public stations. It is centrally located in Door County. The owners are really friendly. We didn't use the pool or bathrooms so can't comment on them. We found this park to be exactly as the GoodSam listing described. It is a family owned park. And it is a well maintained park. We stayed for five nights and the grounds were clean through out our stay. We found the laundry to be clean and reasonably priced. We did not use the restroom facilities. I read reviews on other rv websites stating that it was hard to maneuver because of the numerous trees within the park. We stayed here in a 43' fifth wheel and did not find this to be a problem. The road is gravel and the sites are level gravel pads with nice grassy areas between sites. The park is within an easy 3/4 mile walk of the harbor and restaurants. During the summer season there is a Sunday market on the square that is within walking distance. This area is centrally located on the peninsula and less than an hour you can be at either end and within 20 minutes you can be on the busy side of the peninsula. The park had excellent WIFI service during our stay. And even with the number of trees we were able to get satellite tv. We would definitely stay again. 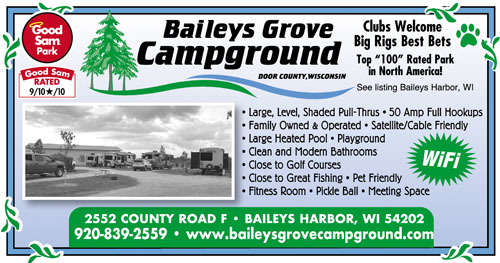 We have camped at Bailey’s Grove Campground for many years. The location is perfect because it is on the quiet side of Door County and you can access the busy side of Door County using back roads, saving aggravation during peak tourist time. This location is also perfect because we love to bicycle, and there are countless options for short and long rides. As for the facility, the friendly owners keep it spotless. The restrooms are thoroughly cleaned once a day, with touch-up cleaning throughout the day. The pool is clean, and the laundromat is very reasonably priced. This place is great for families, and dogs are welcomed. Quiet time is adhered to, which this retiree appreciates. If you are looking for a place to stay in Door County, I highly recommend Bailey’s Grove.